Progressive Battle Cry: Tax The Rich! Tax The Rich! How's It Working Out? New York's projected income tax is $2.3 billion short of estimates. Governor Cuomo cited a need for more taxes. New York Gov. Andrew Cuomo was on the road to Albany when a light flashed before him. Lo, said a voice from the light, progressive taxes are driving out high earners and damaging the state budget. 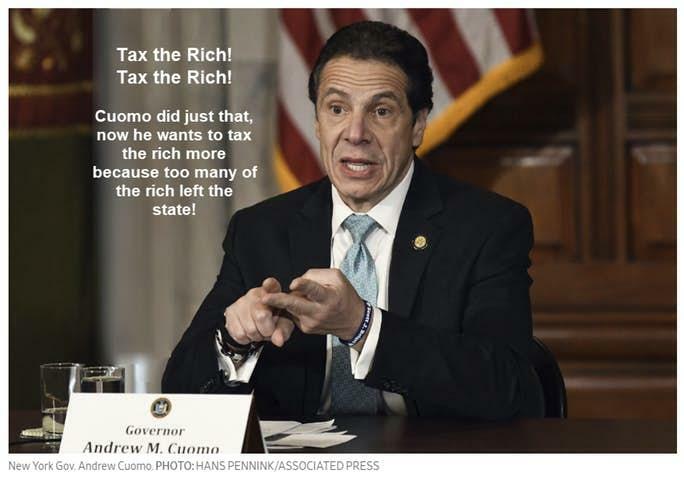 Mr. Cuomo delivered this testimony from the Book of Tax Revelation while announcing Monday that New York state’s income tax revenue over the last two months was $2.3 billion below projections. “That’s as serious as a heart attack,” he said. The top 1% of New York taxpayers pay 46% of state income taxes. Revenues vacillate with capital gains—a problem that is compounded in New York because bonuses in the finance industry are often tied to trading revenue. Markets were especially volatile during the last quarter amid uncertainty about trade and interest rates. The bigger problem seems to be geographic tax arbitrage. Mr. Cuomo notes in a PowerPoint presentation that “anecdotal evidence suggests that high income taxpayers are considering changing their residence and that financial industry firms are looking at real estate outside of New York.” While the Governor blames the GOP tax reform, high earners have been decamping for years, as E.J. McMahon of the Empire Center has chronicled. According to IRS data we’ve examined, New York state lost $8.4 billion in income to other states in 2016 (the latest available data), up from $4.6 billion annually on average during the prior four years. Florida raked in the most New York wealth. Mr. Cuomo says that “a taxpayer in Florida would see no increase, or a decrease” under the GOP tax reform and “Florida also has no estate tax.” New York’s 16% estate tax hits assets over $10.1 million. During his 2010 campaign, Mr. Cuomo promised to let New York’s tax surcharge on millionaires expire. But he has extended it again and again and now wants to renew it through 2024 because he says the state needs the money. Meantime, he warns that a wealth exodus could force spending cuts for education and higher taxes on middle-income earners. Excuse me for pointing out the latest data on moving is from 2016 and that's when the wealthy started leaving in droves. Keep the 16% estate tax and more will leave. But Cuomo wants to keep it because they "need the money". Illinois is in the same situation just as Moody’s Warns Illinois Governor: New Taxes Might Make Illinois Residents Flee. So, go ahead and tax the rich. Then keep doing it until there are no rich left to tax.